Both of Apple’s major operating systems – iOS for mobile and OS X for Mac – have been the subject of heavy updates these past couple of months. The introduction of iOS 7 and OS X Mavericks has meant that many apps, including the iWork family of utilities, have been altered rather significantly. But while some have been pleased with the changes made to the Cupertino company’s famed productivity suite, which consists of Keynote, Numbers and Pages, many of the purists have been bemused with the apparent decision to omit some long-standing key features. As ever, they’ve been inundating the Support Forums with their complaints, to the point at which Apple has now announced some of the important features and changes to be made to iWork in the near future. 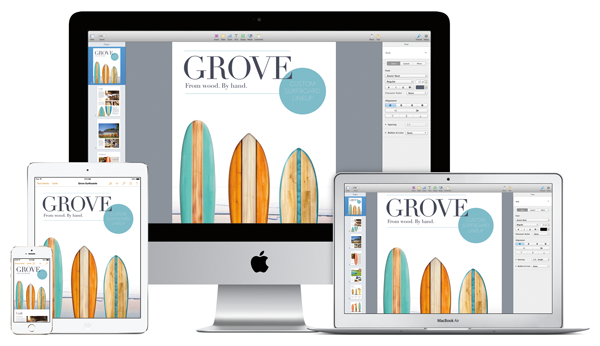 It’s often the case that long-time users have something to say about changes made to certain apps and services, and with the iWork collective clearly bereft of some long-standing features, they certainly weren’t going to go down quietly. The controversy has sparked an all-new support page from Apple, which essentially outlines forthcoming updates to all three apps, and with the schedule time set for the next six months, those lost without their missing features shouldn’t have to wait too long for their return. Obviously, while it’s understandable that users have been vocal in their responses to the new iWork apps, it’s not entirely Apple’s fault. With each component rewritten from the ground up – for 64-bit compatibility as well as support for a mutually intelligible file format between OS X and iOS 7 – the reason for some features being missing on the new releases is to the long-term benefit of the consumer. There are plenty of changes in the pipeline; Pages will, among other enhancements, get a vertical ruler, customizable toolbar, word counts and alignment guides, while keyboard shortcuts for styles will also be reinstated. 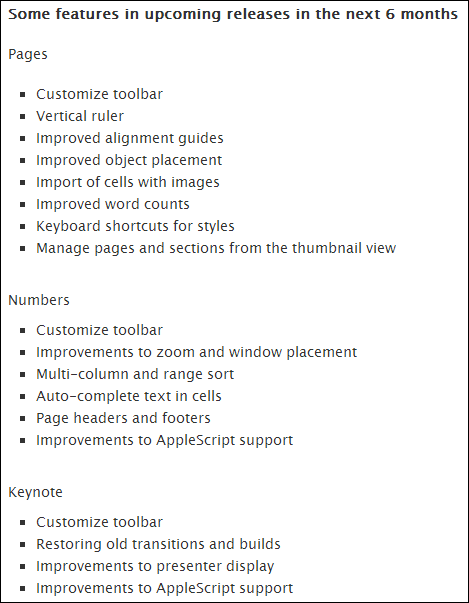 The Numbers app will get a customizable toolbar, better zooming, page headers and footers, and improved AppleScript support. Finally, Keynote will also see better AppleScript support, as well as a return of the familiar transitions and better presenter display. Be sure to check out our Mac OS X Apps Gallery to explore more apps for your OS X powered Mac.